Austin Hallett's long and decorated career in the military began when the Dorset native was with a special unit of the Home Guard. The eighteen year old Hallett and the men of the unit he was part of operated out of secret bunkers, where, in the event of an invasion by the German forces on the British homeland, they were to take up positions to attack the invaders. He remembers having to keep his rifle, ammunition and other gear near to him at all times. At nineteen he was posted to Blackpool for wireless training, then sent to Isle of Anglesey to qualify as an air gunner with the RAF. After crewing up with F/L George Scade, he continued his training at No.24 OUT, and then, after completion of Heavy Conversion training, arrived at 419 Squadron in September of 1943. As the Wireless Air Gunner member of F/L Scade's crew, Sgt. 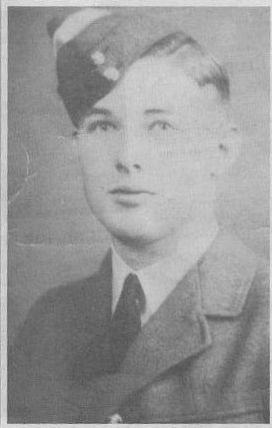 Hallett flew his first operation on September 27/28th aboard a Halifax bomber, an aircraft he remembered later as being the most robust aircraft and his favourite. The crew, with a few changes along the way, continued on with their Tour until August 3rd, completing many sorties of their Lancaster operations with KB750 VR-N.
As Sgt. Hallett's Halifax LW243 VR-Y entered the target area it was attacked without any indication from the Monica radar. Tracers, headed at the aircraft from slightly above astern, were the first indication of the enemy fighter. Sgt. Scade made evasive maneuvres to avoid further damage to his Halifax as the large aircraft continued its spiral dive even after the "resume course" had been given. LW243 finally pulled out of its dive at 10,000 feet. The Halifax was again attacked as it left the target area. Almost an hour after the first attack, the Monica radar detection system gave the alarm of an aircraft behind the Halifax. Sgt. Lee, the rear gunner, could only see the enemy fighter's navigation lights at about 600 yards off. The following evasive maneuvres did not shake the fighter from their tail. The fighter continued to follow them at about 600 yards behind them for 30 miles until they crossed the coast and headed out towards their base. The attack had not injured any of the crew. For Sgt. Hallett, the gaping hole he discovered afterwards, just inches away from his seat, must have come as a shock. The Halifax had sustained a lot of damage. The perspex nose was lost, bomb doors damaged, starboard undercarriage door blown away, a hole in starboard wing and starboard inner cowling, damage to leading edge of port side rudder, and their navigation equipment was destroyed. Sgt. Hallett was with the crew during a second incident with a night fighter just five minutes into the 20th of February 1944. As Halifax JD459 was approaching the target area, Sgt. Lee, the rear gunner, spotted a Ju88 on the skyline on port side closing in for an attack. Lee gave the order for corkscrew to port then opened fire with a short burst. As he tried to fire a second burst, three of the four guns jammed. By this time the enemy fighter had broken off the attack as it neared to 300 yards from the bomber and was lost to sight. Lee was able to clear the guns and they headed on to the target. In August of 1944, P/O Hallett and the rest of the Scade crew flew their last operation and completed their tour. As an RAF crew man, he was allowed time away from operations before starting a second Tour. On August 21st he has posted to No.1664 HCU., then 1666 HCU and in February 1945 was posted to 434 Bluenose Squadron. He accumulated 310 hours over 48 sorties for which F/L Hallettt received a DFC. When the war was over he stayed with the RAF and flew supplies into Berlin during the Berlin Airlift for which he received his AFC. He was later posted to Burma with 194 Squadron. The squadron at this time was engaged in general transport and training exercises. During one of his flights, the cords of the dropped supplies had become tangled with the aircraft, causing the aircraft to lose height as it flew along. To help save the crew, he cut the cords while being held by the ankles out of the open door by one of the crew as the aircraft flew thousands of feet over the jungle. He jokingly told his family much later he was selected since he was the most expendable member of the crew. Postings to 62 Squadron, then 52 Squadron and finally for VIP duties with RAF in Japan. He eventually retired from the RAF in 1970, the same year he received his MBE. He retired to successfully run a Post Office and shop in Blackpool, where his customers never knew the quiet man they met everyday lived a series of exploits which they could never imagine. Only through prying would he relate to his family some of these adventures. Austin Hallett passed away this November (2015) on the 12th, which is also listed as his birthday. On that very day, his family received a Legion of Honor medal, sent from the French Embassy a few days earlier.